Marco Polo have, to their credit, tackled the complete range of formats of classical music. Orchestral music has always been a strong feature of their catalogue and to this has gradually been added opera, chamber music and, as here, major choral-orchestral works. Their output has taken in Stanfords Requiem and Havergal Brians Gothic Symphony amongst much else. Gerard Victory was a Dubliner born there in 1921. He was director of music with Eire Radio from 1967 to 1982. He had various operas to his name as well as four symphonies, the last of which was premiered by the Eire National SO in July 1991. He is a composer using tonal material but with a stinging imagination and happy to use effects adopted by more doctrinaire composers. He is an accommodating eclectic as anyone listening to this magnum magnum opus will discover. Ultima Rerum (last things) is a vast pan-faith requiem aspiring to one of the most elevated of subjects: life-death-afterlife. The cantata tracks the line from despair in the face of icy death to joyous sinking into the ecstatic light. Have we been here before? This is an extremely colourful and spicily coloured work but the terrain has been explored before by Delius in A Mass of Life and the Pagan Requiem - remember the calls of allah-il-allah in the latter pitched against the cries of alleluia. Deliuss confidence in negation and victorious nature however is not the philosophy of Ultima Rerum. Victorys 100 minute work burns with religious feelings and draws on the literature of a wide spectrum of faiths and beliefs. The 10 segments of this encompassing requiem are arranged around the constituent parts of the latin Requiem. The segments are evenly divided across the two discs. Woven among the strong and familiar fibres of the requiem is a rich stew of extracts from other literature - all well judged. The streaming together of words from various faiths reminds me of Delius and it is good to see that words which inspired Delius are also chosen by Victory: Whitman and Flecker (from Hassan). The final Agnus Dei drives forward questingly - juxtaposing words from the requiem and the very Whitman words which inspired Vaughan Williams in his Sea Symphony. The treatment is lighter than the RVW occasionally leaning on the example of Messiaen and Ligeti-like wailing but without the density and complexity of either composer. The work ends in a satisfying and mysterious diminuendo and registers all the more effectivrely for avoiding the cliché of the burning sunset and eternity!. The work opens in mystery with Britten-like chirruping from the wind. The second section is passionate. The opening of the second disc is notably jubilant. A prominent part for saxophone in the Canzone is memorable chiming with and introducing the solo contralto. Adrian Thompson generally heroic and secure seems rather wobbly and strained in the later part of the Sanctus. However he is wonderful in the best music e.g. Peace come away - a chimingly melodious and serenading tenor. This movement has a steady-paced Holstian stride like something from the Grecian Urn movement of Holsts Choral Symphony. The In Paradisum has spoken segments similar to Holsts Hymn of Jesus and the more mystical RVW. There is also a hint of plainchant. This is a work of many pleasures and I am not going to try to list them all. Who knows perhaps this is a signal that before too long such works of potential universal appeal as Foulds World Requiem (a work with a reputedly overwhelming emotional impact linked with the dead of the Great War) and Vision of Dante may be on the menu. While we are at it when are we going to have fresh recordings of Leroy Robertsons impressively Hansonian The Book of Mormon and first recordings of Peter Racine Frickers Vision of Judgement (complete with superficial Belshazzar influences) not to mention Arthur Blisss Beatitudes, Cyril Roothams Ode on the Morning of Christs Nativity and that giant symphonic tapestry Bantocks three hour setting of the Rubayyat of Omar Khayyam. Forgive the usual wishlist. Gerald Victorys own notes complete the picture. All the texts are there with translations into English where necessary. The two discs are accommodated in one of those clever double hinge single thickness cases. I wish more manufacturers would use them. 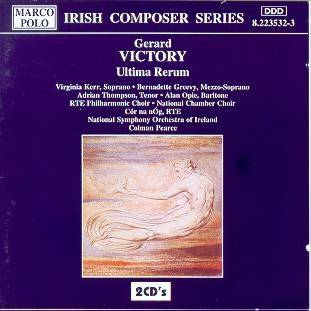 To return to Victory let me recommend this splendidly detailed multi-faceted and emotionally rewarding work and recording. It has a vitality and emotion that only occasionally is apparent in Brittens Spring Symphony (another anthology work) and is brighter though more diffuse than Rubbras Sinfonia Sacra. Its colourful and passionate approach to orchestration and word -setting place it on a similar plane to the choral works of William Mathias (Lux Aeterna, This Worldes Joie and Worlds Fire) and George Lloyd (Vigil of Venus and Symphonic Requiem). There are some grippingly beautiful passages which might put you in mind of Rutters Requiem although there is a depth here which is missing from the always gorgeous Rutter. Perhaps Howells three great choral works (Hymnus Paradisi, Missa Sabrinensis, Stabat Mater) are better parallels.